The Stora-Laxa in Hreppum is one of the country’s most amazing rivers. For admirers of magnificent nature, where man experiences humility in presence of all creation, it is a true wonder. 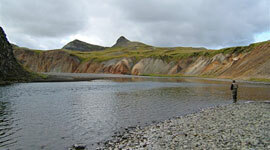 This is one of the places in the south-west of Iceland where anglers are most likely to hook a large salmon. Indeed, some fishermen who have learned the secrets of the Stora Laxa are drawn back every year. 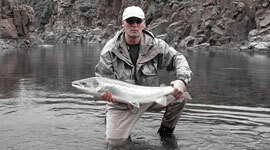 Rod availability is on the lower beats (Beats 1 & 2 are combined) and contain many of the river’s best known pools. Access is easy to most of the fishing sites along these beats. Accommodation is available on the lower section (Beats 1 & 2) sleeps 8. The cabins have well-equipped kitchens and are ideally placed in attractive landscape settings, assuring privacy.The Stora-Laxa in Hreppum is one of the country’s most amazing rivers. For admirers of magnificent nature, where man experiences humility in presence of all creation, it is a true wonder. 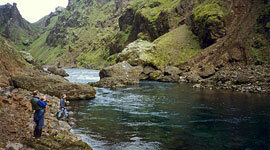 This is one of the places in the south-west of Iceland where anglers are most likely to hook a large salmon. Indeed, some fishermen who have learned the secrets of the Stora Laxa are drawn back every year. Accessible fishing at only 115km east of Reykjavik. For more information please click or contact our Head Office on 01573 470612 to speak with one of of angling experts.